We spent the afternoon in Yokohama dodging the drizzle where we could, walking by Kanamara Matsuri and the port, grabbing some bar snacks (including burdock chips! recommended) and focusing on Chinatown (there are a few photos in a slideshow below). 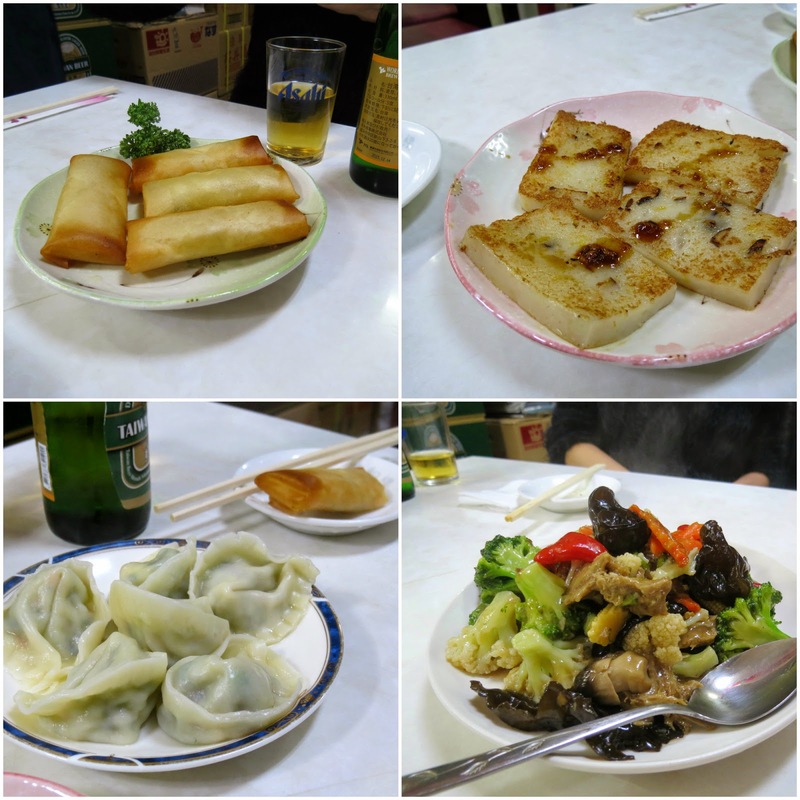 We sought out Banwarou for dinner, a Taiwanese restaurant mentioned on Happy Cow. Although Banwarou serves meat and does not have menu printed in English, it's not too hard to cobble together a veg-friendly feast. 'Vegetarian' is printed on the door and the restaurant owner is keen to assist in limited but enthusiastic English and a side of gesticulation, including a check on whether or not we eat eggs. Inside and out, the walls are lined with photos of their food, and one side is especially dedicated to their vegetarian options. Our haphazard pointing brought rich rewards - crispy spring rolls (650円 ~ AU$7.00), mochi (which we are more accustomed to calling radish cakes, 650円 ~ AU$7.00), gyoza (650円 ~ AU$7.00) and stir-fried soy beef and mixed vegetables in a salty cornflour-thickened sauce (1890円 ~ AU$20.40). One of the highlights was a plate of slippery, sweet chilli eggplant (1470円 ~ AU$15.90), which reminded us of the fish-flavoured eggplant in Melbourne's Dainty Sichuan. The fabulous finale was pulled off with the help of a bilingual vegan Kiwi at another table. At his and the restaurant owner's joint recommendation, we ordered the vego mapo tofu (1100円 ~ AU$11.90) and the sesame noodles (850円 ~ AU$9.20); tossing but not stirring the sesame noodles with chopsticks, then scooping the two dishes into our individuals bowls as a saucy, hearty, rich and spicy melange. Without Happy Cow's help, we would've walked right past Banwarou - many of the meal photos are meaty and the interior is cramped with few apparent frills. But the restaurant's warm and outgoing owner is undoubtedly its best feature, with the veg-friendly food a firm second. Banwarou has also been blogged by Vegan Marathon Runner. Accessibility: The entry is flat and the interior is small and very densely packed. We ordered and paid at our table. The toilet is inside, narrow and unisex.